Mazak introduces the Integrex j-300, a multi-tasking solution that specializes in 4-axis simultaneous machining with 5-axis tool tip positioning. It performs turning, milling and drilling operations for the quick, accurate processing of simple and complex workpieces in fewer setups. 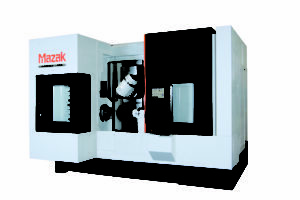 The machine also features a powerful 30hp, 12,000rpm milling spindle that allows for 4-axis simultaneous machining, plus 5-axis tool tip positioning indexed in 5º (or optional 1º) increments from –30º to 190º (B-axis control). This capability makes it possible to perform O.D. machining, as well as turning, facing, grooving, and threading with the same flash tool. It also increases the efficiency of incline machining, as well as all other conventional machining processes. Because of its ample Y-axis stroke of 9.84”, the Integrex j-300 has a larger machining envelope and extended tool reach with minimum interference, and chip evacuation is much more efficient as compared with conventional turn/mill slant bed lathes. Additionally, the milling spindle can be radially indexed and clamped, enabling the same tool to be used for turning in both forward and reverse directions. Due to its highly rigid machine construction and new high-response servomotors, the Integrex j-300 delivers highly repeatable tool tip positioning.